There are three numbers you will come across when considering purchasing a solar inverter based on its efficiency: peak efficiency, Euro (η) efficiency, and CEC efficiency. Which one is most important when considering which inverter to buy? Many people look only at peak efficiency, but the truth is that this number does not reveal a lot about solar inverter performance in actuality. Efficiency, in terms of solar inverters, is a percent measure of the conversion of DC electricity from your solar panels (or batteries if you have them) to AC electricity (which your appliances and the electricity grid use). Peak efficiency: This measures the efficiency of your inverter at one point–when it is performing at its best. So simply put, peak efficiency is calculated as DC input to AC output when the inverter is operating at (usually) its rated capacity. Although this is a noteworthy number, it is not the final word on inverter efficiency. Your inverter may only operate in its peak efficiency range for a very small proportion of the day–or not at all. Efficiency varies for an inverter depending on the input power from your solar panel array, as you can see in the graph below. Solar inverter peak efficiency is a measure of your inverter’s efficiency at a specific level of input power (watts). In this efficiency curve, peak efficiency is about 250W. Euro/EU efficiency and CEC inverter efficiency: These types of efficiency are ‘weighted’ efficiencies. These are more useful figures than peak efficiency because they measure inverter performance across the range of the inverter’s capacity. This gives you a better idea about the inverter’s operating profile over the course of the day. What is a weighted efficiency? Instead of looking only at how the inverter functions at its power input ‘sweet spot’, calculating weighted efficiency requires first selecting a few DC input levels relative to the inverter’s rated capacity. For Euro and CEC (California Energy Commission) efficiency, there are 6 efficiency points in the calculation (see below). 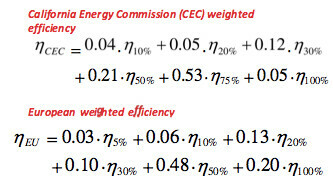 CEC vs Euro weighted inverter efficiency formulas. The difference between the two is in how each input level is weighted. The coefficients ‘weigh’ the importance of performance of each level, based on assumptions about how often your inverter will function at each level. The difference between Euro and CEC weighted efficiency lies in the difference in how they allocate their weights to arrive at an average efficiency. You can see, for example, that both CEC and Euro weight an inverter’s performance at 30% capacity with a coefficient of about 0.10. By contrast, the Euro formula includes a meausure at 50% but not 75%, and CEC vice versa. One is not necessarily better than the other, but you should be aware that these differences may result in different efficiency numbers for the same inverter. 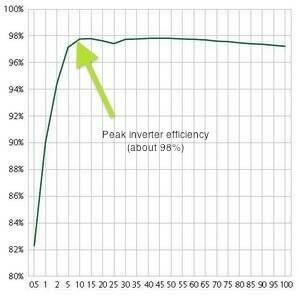 Although both these efficiency ratings are a great ‘at-a-glance’ perspective on an inverter’s efficiency, the best thing you can do for your own solar system is to look at your inverter’s efficiency curve, which tells you in detail how an inverter will perform with your solar array at different output levels. This, in combination with the knowledge of how well your solar panel array performs throughout the course of the day, will enable you to most accurately understand your inverter’s performance. Understanding your inverter’s efficiency curve will be especially relevant if you’ve oversized your inverter with the future expansion of your solar array in mind. Performance wise one is as good as the other, providing you’ve gone with a reputable inverter manufacturer. The choice between the two really comes down to your personal circumstances and preferences, as well as budget. Our Solar Brokers can help you work this out, along with various other aspects associated with making a well informed choice of installer. You can call us directly on 1300 78 72 73 or we’ll automatically allocate a broker to you if you fill in the Solar Quote Comparison form to the right of the page. We look forward to helping you further soon. Next post: Is Solar Power right for you in NSW?